For the Harvard men’s ice hockey team, the 2016-2017 season marked one of the most dominant senior class performances in the program’s history. 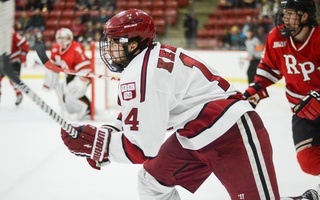 The seven fourth-years, headlined by an all-senior second line and steady leadership from co-captains Alexander Kerfoot and Devin Tringale, collectively totaled 193 points during the year. The Crimson, however, would have been far from a Frozen Four team had it not received contributions from some of its younger members. Junior goaltender Merrick Madsen, sophomore forward Ryan Donato, and freshman defenseman John Marino all impacted the season immensely, but it was rookie blueliner Adam Fox who had perhaps the most influence. 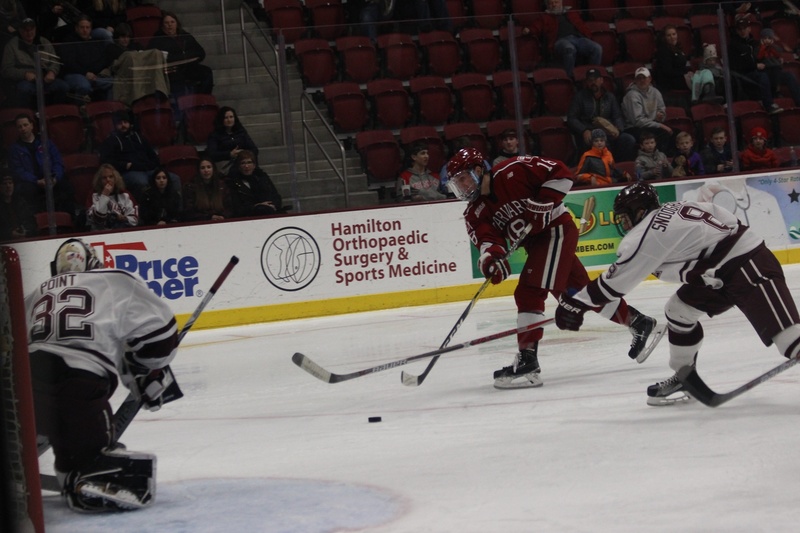 Playing in the Frozen Four, rookie defenseman Adam Fox speeds toward the goal. The star freshman filled an invaluable role for the Crimson this season, rounding out the back end’s top four while manning the point on the team’s first power play unit, whose .264 conversion percentage was fourth in the NCAA. Fox distinguished himself not only from other first-years but from the entire Division-I field, too. The Jericho, N.Y., native finished the season atop all defensemen in points and assists, with 40 and 34, respectively. Fox also set the scoring pace with the man-advantage, tallying 22 assists and 24 points overall on the power play. Moreover, he ranked fourth in points among freshmen and was the only blue-liner among the NCAA’s top 22 point scoring rookies. Fox was downright lethal all season, and the league took notice. And what the 5’10” point man lacks in size, he compensates for in speed and craftiness. Fox’s scoring total this season fell just six points shy of Harvard’s all-time record for a defenseman, set by Mark Fusco ’83 in his senior season, for which he won the Hobey Baker Memorial Award, given to the best player in college hockey. 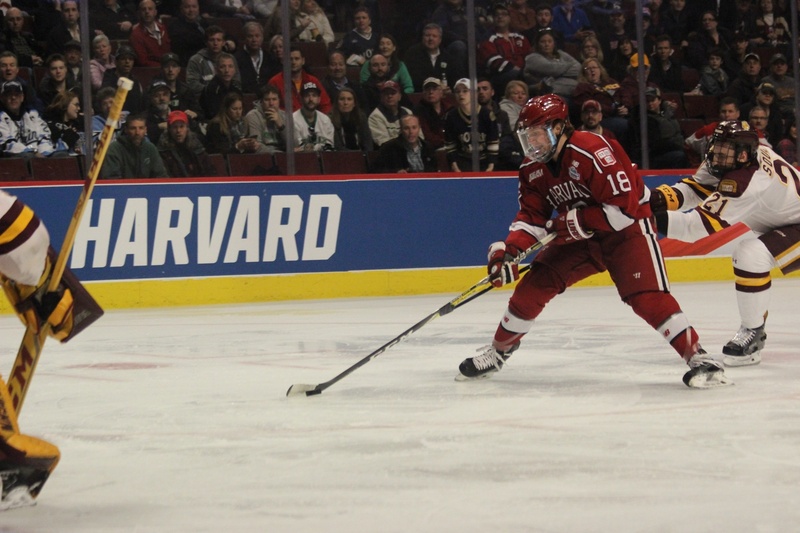 The Crimson’s most recent Hobey winner, Jimmy Vesey ’16, notched only 18 points in his first campaign. Fox reached historic or near-historic levels on multiple other fronts this season. After he fell just four passes short of Harvard’s all-time record for single-season assists by a defenseman, his passing prowess still has him on pace to hold the school’s career record in the category. Compared to this year’s Hobey winner, Denver’s senior defenseman Will Butcher, Fox finished with more assists and points despite playing in eight games less. This type of play is what it will take for Fox and his fellow Crimson icemen to debunk the notion that Harvard, lacking the scholarships and overall recruiting leverage of some of the nation’s hockey powerhouses, is not an annual NCAA title threat. The Calgary Flames prospect played in all 35 games for which he was available this season—his sole absence from the Crimson lineup, for a late December matchup with RPI, is quite easily explained. While Harvard battled at the Bright-Landry Hockey Center in Cambridge, Fox was in Toronto, Can., donning the red, white, and blue as a member of the U.S. World Junior Championship roster. Fox played in all seven games for the stars and stripes en route to the U.S.’s gold medal victory over Canada in a shootout. The rookie blue-liner, of course, had the full support of his team despite the one-game absence. With countless moments of brilliance throughout the season, such as an impressive 11 multi-point performances, it’s no wonder that the awards came flooding in after Fox’s freshman campaign. "He's playing chess while everyone else is playing checkers," Harvard coach Ted Donato said. The defenseman received the major honors of First Team CCM/AHCA All-American, ECAC Hockey and Ivy League Rookie of the Year, and ECAC and Ivy first team selection. 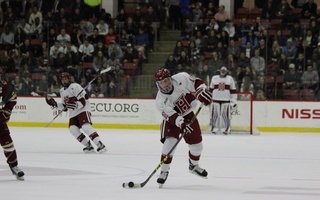 In addition, Fox was named to the tournament team for both the ECAC and NCAA East Regional playoffs. Within the walls of Harvard, Fox, along with fellow first-year Nathan Krusko, earned the honor of the George Percy Award as the premiere rookie for the Crimson. These accolades are simply testament to the fact that Adam Fox, Harvard’s puck wizard on the blue line, put forth one of the most impressive rookie seasons of any athlete on campus this year. —Staff writer Spencer R. Morris can be reached at spencer.morris@thecrimson.com. The Flames added 18-year old Adam Fox to their mix Saturday morning, selecting the incoming Harvard freshman with the 66th overall pick in the third round of the NHL Entry Draft. Fox is now one of seven NHL draft selections on the Crimson’s roster for the 2016-2017 season.